Having visited my hometown, Vancouver, in November, I took it upon myself to see if I could find good Japanese food there. I made a promise to myself and also partly as a challenge from my brother from earlier in the year, to try going to an izakaya in Vancouver. I went into things with a bit of prejudice as I feel that you can’t get any better than an izakaya in Tokyo or Japan for that matter. I feel that izakaya outside of Japan would not be real and that a lot of them would be really fake. I am happy to report that while I was not correct in my assumption, I was not completely wrong either. I went into the experience with an open mind and felt that I gave them all a good objective look. While there are several different izakaya in Vancouver, I limited myself to the Japanese owned and operated ones in order to avoid being let down. Let’s face it, when going to a sushi restaurant in North America, more times than not it is run by Chinese people, or non-Japanese. They don’t know what the real flavour of sushi is, nor do they know how to give you an authentic Japanese experience. Going to one of the non-Japanese izakaya would have probably degraded my overall experience. With only 2 weeks in Vancouver, I had a chance to go to only 2 different izakaya. One of the main ones I went to was Guu. Guu claims to be the first izakaya in Vancouver. They originally opened in 1993 but underwent a name change in 2000 to Guu. It is named after the Japanese sound of a hungry stomach. Guu is probably the largest izakaya chain in Vancouver with 6 locations, including 2 in Toronto. They have daily menus and the chefs and servers are all Japanese. I went to the Kobachi location on Denman Street and it was a blast. I wanted as close to a party experience as I could get, so I invited a lot of friends, especially people from Japan or who have lived in Japan. It was a drink fest to say the least. I had a wonderful time catching up with some of my old friends who left Japan as well as those who have never been to Japan. It was fun to introduce a friend who had no idea about what real Japanese food was. The servers were really great too and I couldn’t have asked for a more Japanese experience in my own hometown. I am happy to learn about this place but unfortunately the menus were difficult for me to read. While I can read Japanese well enough, the chicken scratch they had was really difficult. It was truly hand written which adds an interesting twist to everything but since I never grew up reading Japanese, it was difficult for me to read. I can’t remember all of the foods I ate but it was generally fusion food. Some dishes were very close to the real Japanese style, but a lot of it was infused with a lot of west coast ingredients to make things unique. Neither Japan nor Vancouver izakaya are better; they are just different. Drinking Sake in Vancouver Because I Can! The other izakaya I went to was Suika. This izakaya is located just a few blocks from my home, so it was easy to just walk there and drink, drink, drink. Suika is more fusion than authentic, and they really play that game. The interior was very dark and it didn’t remind me of Japan at all. It actually felt a little more Korean in terms of style, but the decor around the restaurant was very modern Japanese. I never had the food but it looked interesting. The most eye catching item was the Chinese Poutine. The Chinese Poutine is a fusion of Canadian poutine with some Chinese flavours. Something you would never expect to see in Japan, but a very interesting Canadian dish. The beer at both Guu and Suika are the same as you can order Sapporo. Both offer a variety of sake to drink, but I have to admit that Guu had a better selection. Suika didn’t have the selection of Guu, but they made up for everything with their service. It was probably because I went there a few times, but I felt more relaxed at Suika. 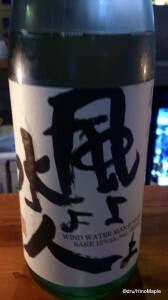 The staff remembered me after the first time and the bartender knew her sake. She was kind enough to give recommendations and even warned me about getting drunk because the sake had a light taste. Suika also got extra points for their take on their name. As many of you know, Suika is the Japanese word for watermelon. It is also the name of the IC Card used in the Tokyo area for transportation as well as a form of payment. Suika uses this similarity to create a lot of similarities, such as their coasters looking like a Suica card, but with a watermelon motif. 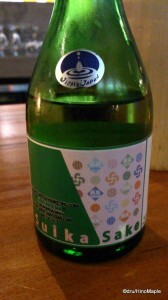 Their signature sake, “Kingyo” also has a special label for Suika that resembled the famous Suica card too. It was a lot of fun to see that in Vancouver and it made it difficult for me to leave Vancouver, especially now that I know where I can enjoy good sake and good Japanese food. While the izakaya in Vancouver cannot match the Japanese ones on price and taste, they are still great places to go. The food is not as authentic as I thought it could have been, but with such great ingredients in Vancouver, it is hard not to use such fresh ingredients. The servers and chefs at both restaurants were great and they could all speak Japanese. While not all of them were from Japan, they did have a native level of Japanese and they were very friendly too. Combine the Japanese politeness with Canadian friendliness and you have the experience of an izakaya in Vancouver. When I return to Vancouver, I will definitely go back to Suika as well as Guu. I may even try to go to some of the other famed izakaya. I did hear of a reputed izakaya that is run by Chinese people, but I am afraid that would break my image of how good izakaya are in Vancouver. Don’t worry, I won’t be leaving Japan anytime soon, but at least I know I have a home away from home in Vancouver, or should that be a new home in Vancouver. 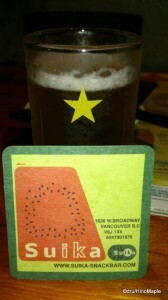 This entry was posted in Canada Food and tagged canada, Guu, Guu Kobachi, izakaya, Kobachi, SUICA, Suika, vancouver, Watermelon by Dru. Bookmark the permalink. Guu! I went a long time ago (Denman? ), I think not too long after they first opened, and loved it. We went to the Gastown location when we were back over the summer, however, and I wasn’t quite as impressed. But I did like the atmosphere. I have no idea what you okes are talking about, but clearly Japan has better izakaya and Canada has better hamburgers. “Combine Japanese politeness with Canadian friendliness”? Now that sounds like totally perfect customer service.